In the film industry, nothing pays off like creativity and innovation. The makers of an upcoming youthful movie, ‘Om Mangalam Mangalam’, have resorted to an innovative video campaign for their star hunt. The short video introduces all the stars the makers introduced to Tollywood over the years, and urges all the aspirants to shoot a 1 minute video of their performance and mail it to them by 31st December. The promotional video for this star hunt has been appreciated by stars like Manchu Lakshmi, Sundeep Kishan and Aksha etc, who have urged aspirants to try their luck. 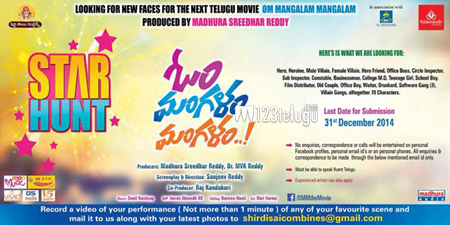 Produced by Madhura Sreedhar and MVK Reddy, ‘Om Mangalam Mangalam’ is being directed by debutant Sanjeev Reddy. The makers are hunting for the film’s hero, heroine and other major characters.